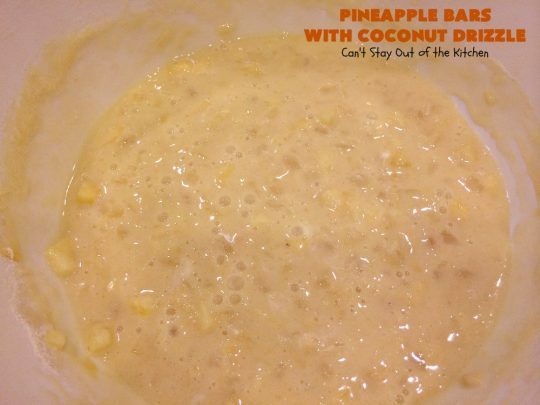 If you suffer from pineapple cravings, this dessert will certainly satisfy that and any other sweet tooth craving you may have! These jewels have a crust layer, then a pineapple layer with a streusel topping on top. 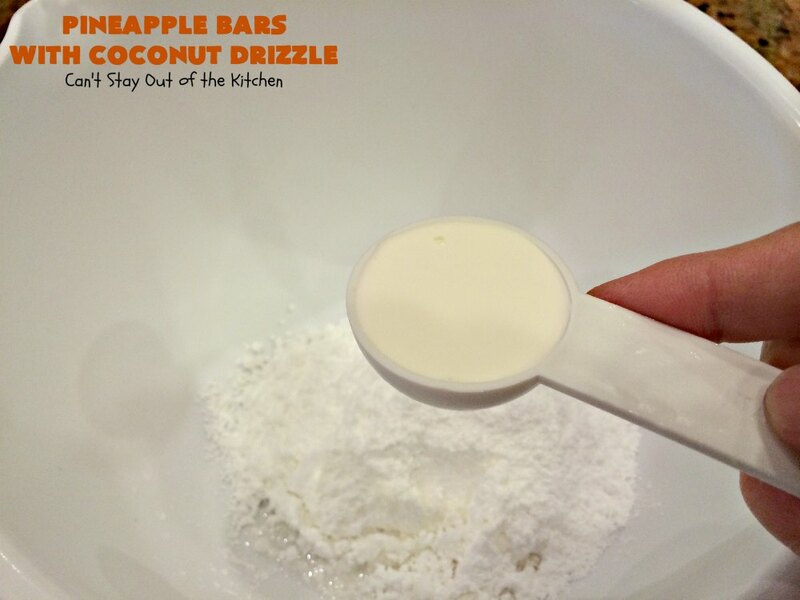 After baking the bars, the Coconut Drizzle is added as a glaze. These bars are sweet comfort food at its best! Not only that but they’re not too difficult to make, or very expensive. I carry coconut extract in my pantry. 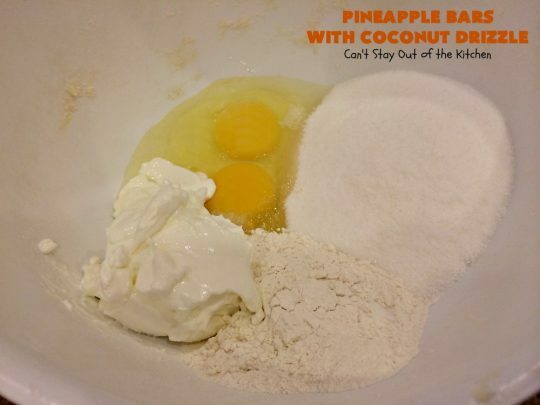 That is the only ingredient for this recipe that is out of the ordinary. 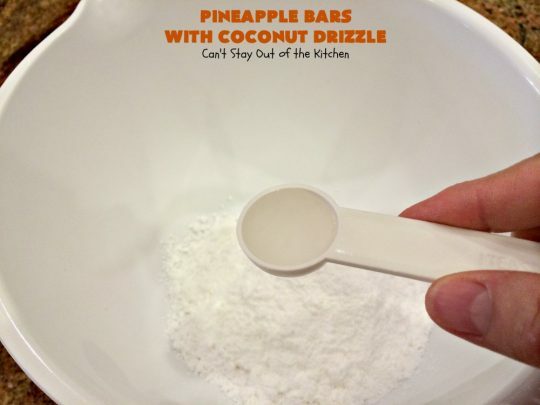 Everything else you may have on hand except for crushed pineapple. Although I usually have that on hand, too. I was trying to use up some crushed pineapple that I had in the refrigerator after making Polynesian Chicken a few weeks ago. So these dessert bars were great for that. As it happened, I didn’t have quite enough pineapple for this recipe. But I had a cut up pineapple in the refrigerator. I added a little of that diced finely to give the full amount needed. I saw these lovely bars on Pinterest a few weeks ago. 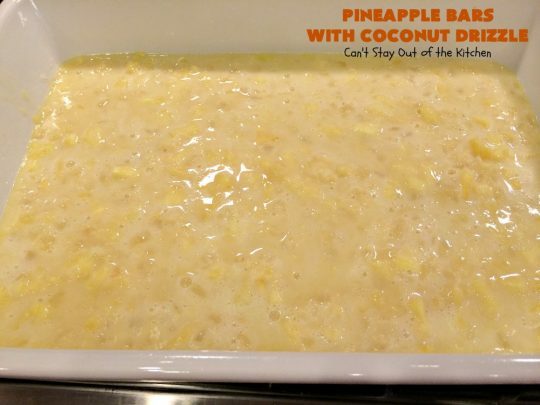 Because of my husband’s love for pineapple, I knew they would be a big hit for him. The texture in these Pineapple Bars was amazing. 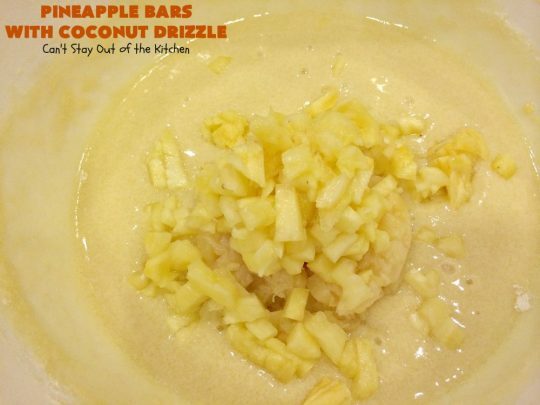 And the Coconut Drizzle was spectacular! There’s no actual coconut in the recipe–only imitation coconut flavoring in the icing. I will have to make up another batch of these bars soon. John took a couple of containers of these goodies and gave them away to friends. They just raved and raved over how much they enjoyed these amazing treats. This is a fabulous, though gooey, dessert for company and special occasions. If your family members love pineapple, then this recipe should wow them completely. I can’t begin to tell you how wonderful these bars tasted. They were yum, yum delicious! 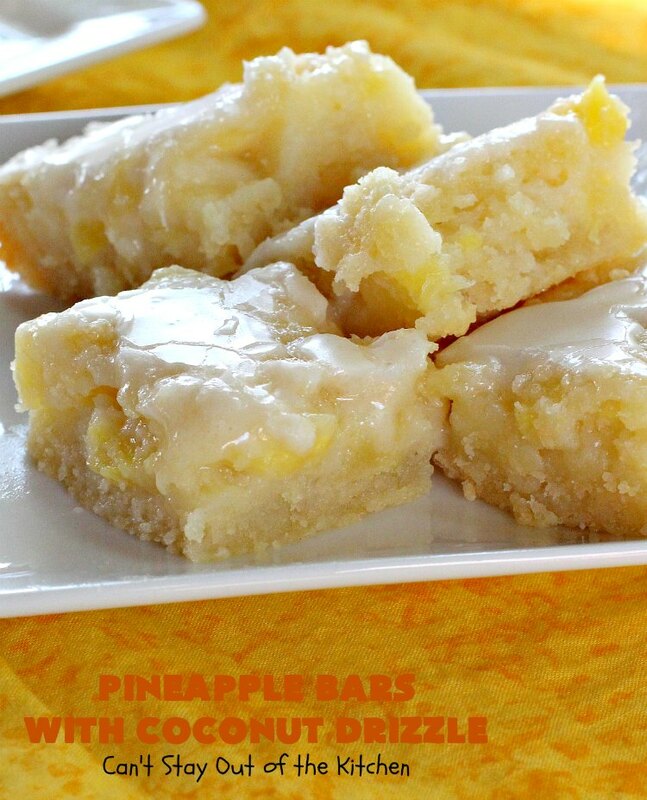 Pineapple Bars with Coconut Drizzle is like eating Pina Colada Bars! These luscious Pineapple Bars with Coconut Drizzle will certainly cause you to drool! 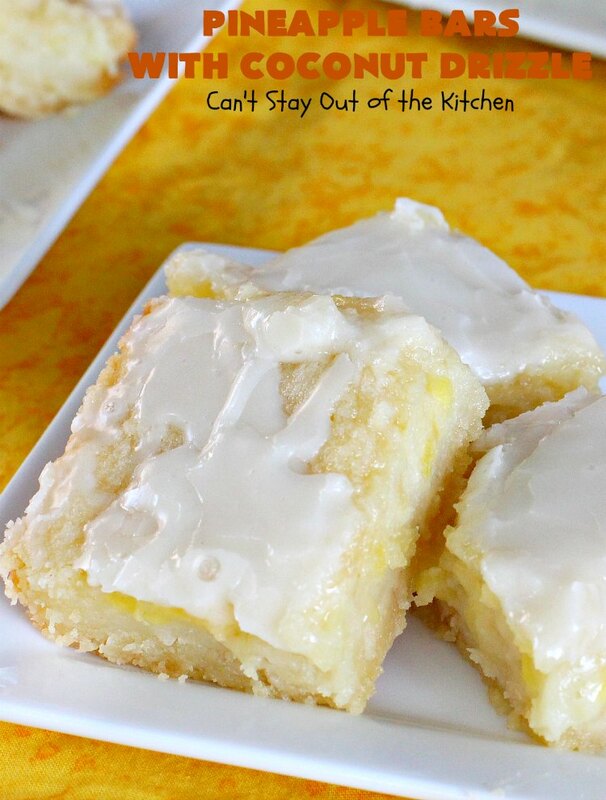 These dessert bars are so sensational! 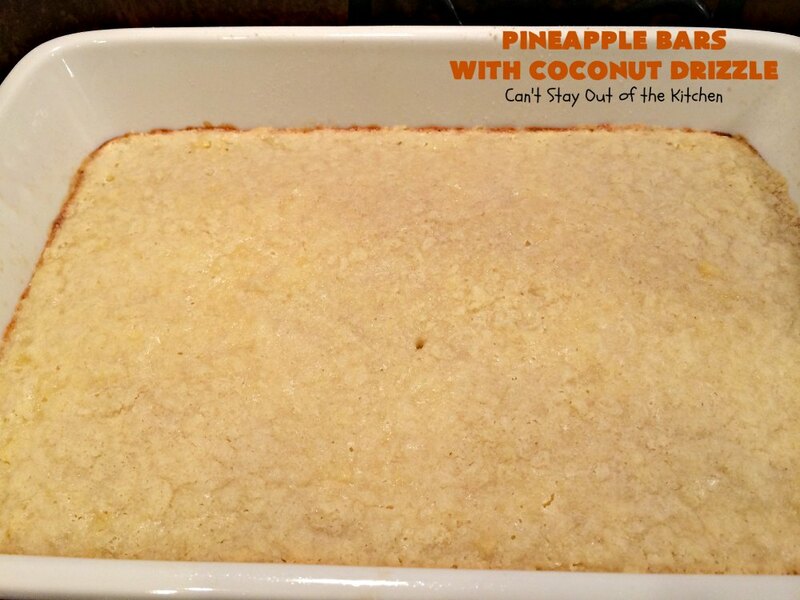 Your family will love them especially if you enjoy the flavors of pineapple and coconut. I used these ingredients for the crust layer. Mix flour, sugar and salt. Cut in butter with a pastry blender until coarse crumbs form. Reserve one cup of crumbs for the streusel topping. Press remaining crumbs into a greased 9×13″ glass baking dish. Bake at 350 for 15 minutes. I used these ingredients for the pineapple layer. Place UNBLEACHED all-purpose flour in a bowl. Bleached four toughens baked goods. Add sugar, salt, eggs and sour cream. Remove crust layer from oven after 15 minutes. 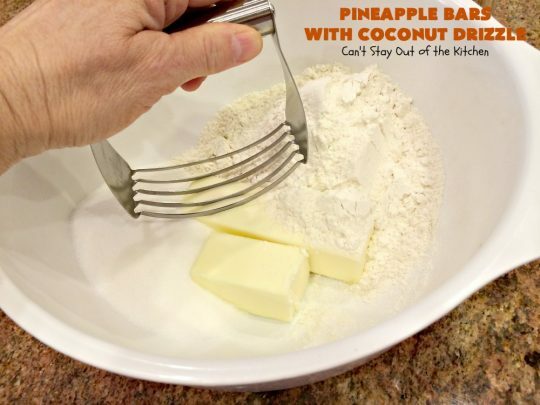 Pour pineapple filling over top of the crust layer. Sprinkle with remaining one cup reserved crumbs. Bake at 350 about 30-35 minutes or until set. (The original recipe said to bake this for about an hour but mine only took about 35 minutes). 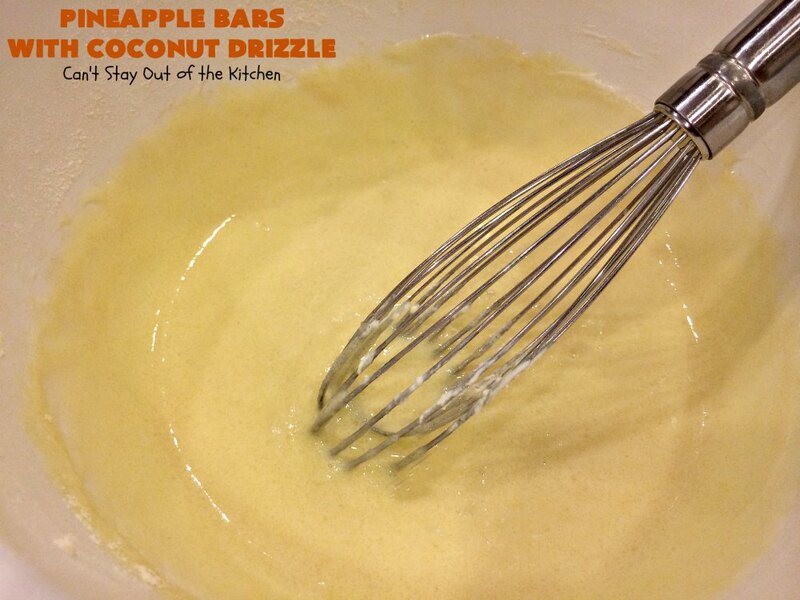 Allow bars to cool completely before adding drizzle. 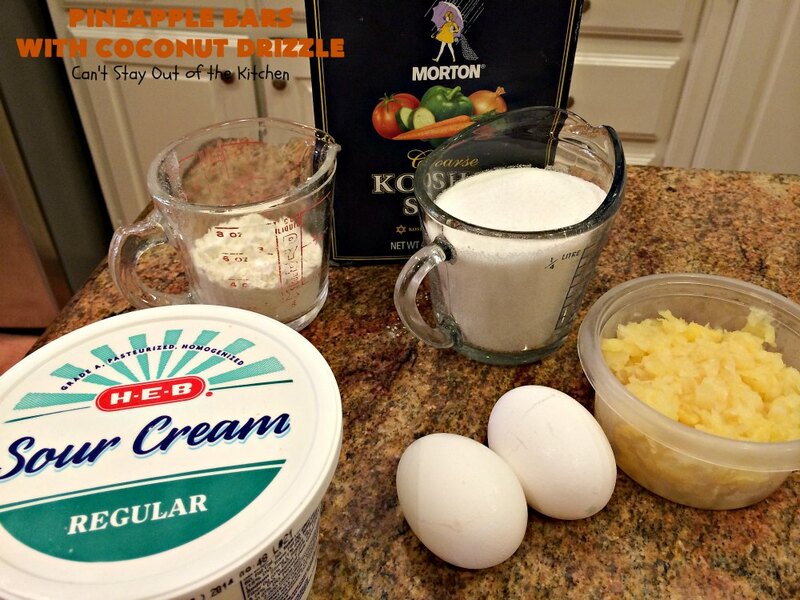 I used these ingredients for the coconut drizzle. Place powdered sugar in a mixing bowl. 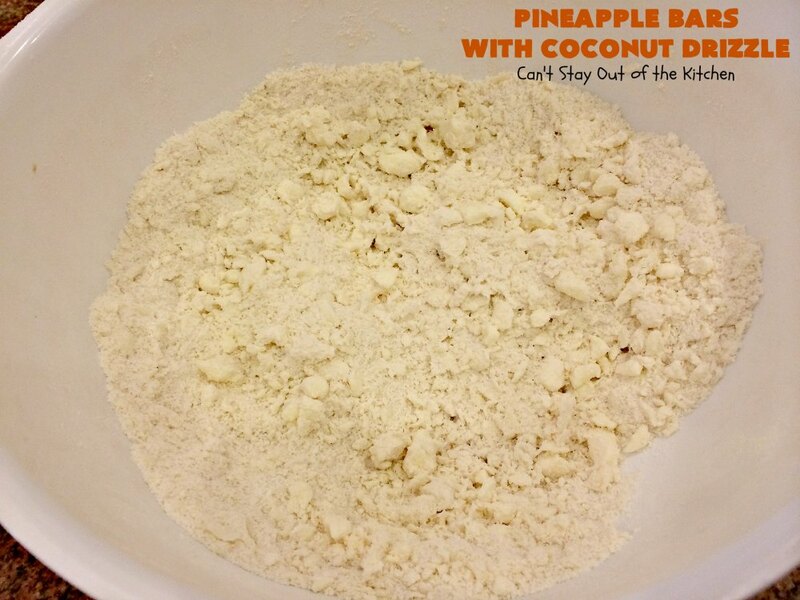 Add coconut flavoring. 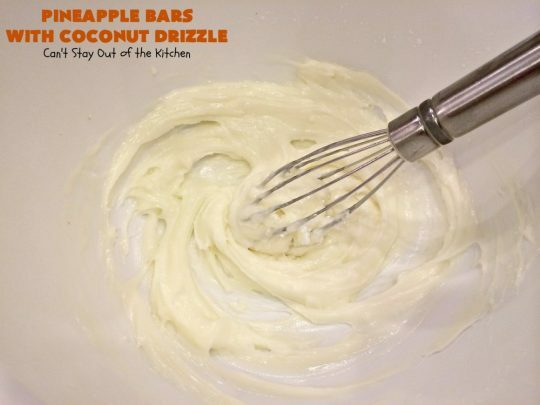 Drizzle icing over top of cooled pineapple bars with a fork. 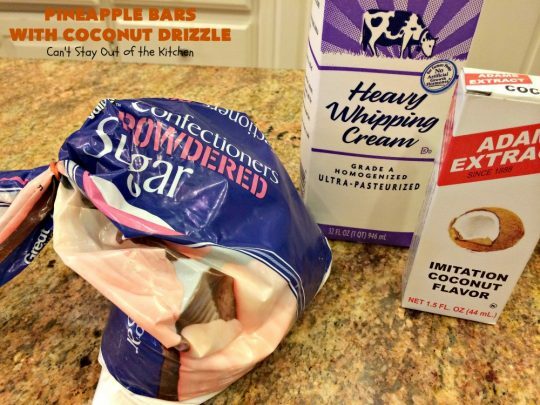 Allow icing to set an additional 15 minutes before cutting into bars. 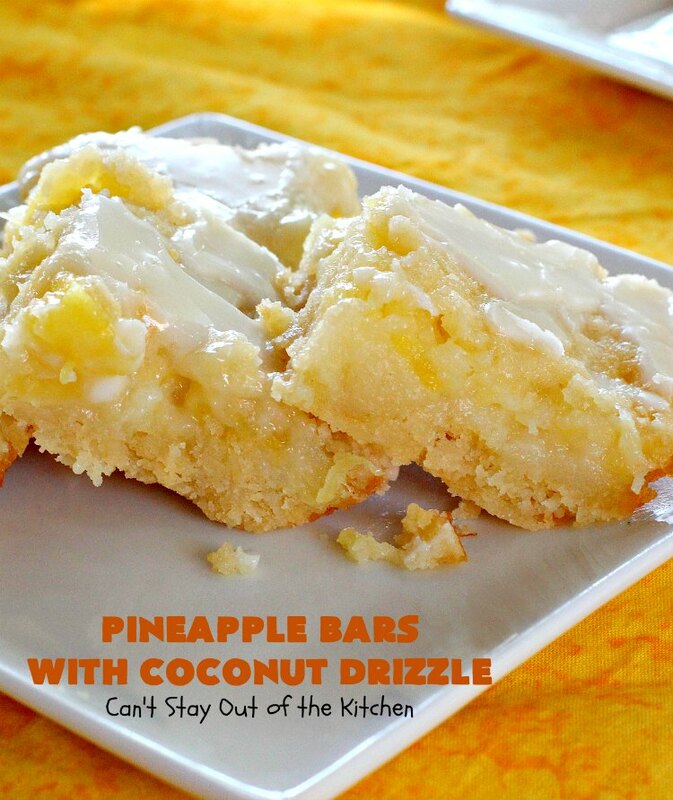 Pineapple Bars with Coconut Drizzle are ooey, gooey and delicious! If you enjoy pineapple, you will love this fantastic recipe. Luscious dessert bars have a crust layer, topped with a pineapple layer and streusel topping, then glazed with a coconut drizzle. 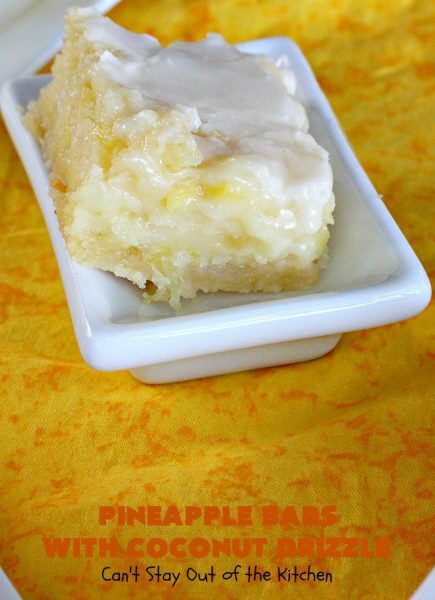 Taste like Pina Colada bars! Terrific for holidays like Easter, Mother's Day or Father's Day. All your company will be swooning after one bite! Stir flour, salt and sugar together. Add butter and cut in with a pastry blender until well blended. Pour remaining crumbs into a greased 9x13” baking dish and press down firmly. Top with filling and bake an additional 30-35 minutes or until filling ingredients are set. Cool 15 minutes before adding coconut drizzle. Whisk eggs, flour, sugar, sour cream and salt together. 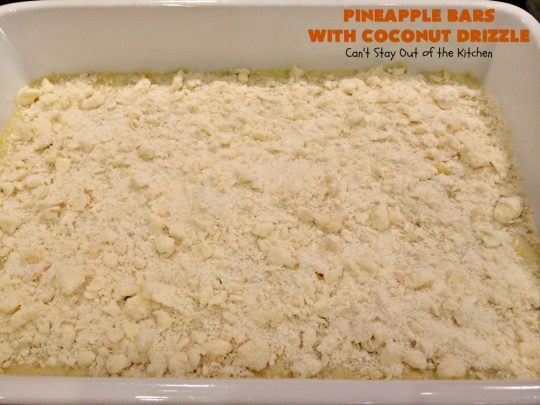 Pour pineapple mixture over top of baked crust layer. Sprinkle filling layer with remaining cup of crumbs. Bake at 350° for 30-35 minutes or until set. 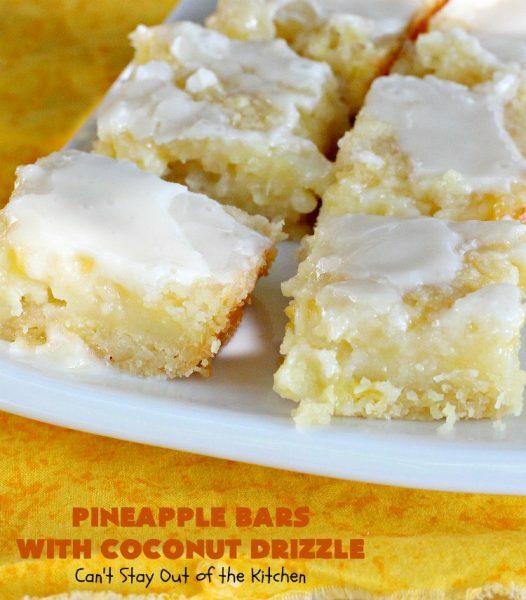 After bars have cooled 15 minutes, drizzle icing over top of Pineapple Bars with a fork. 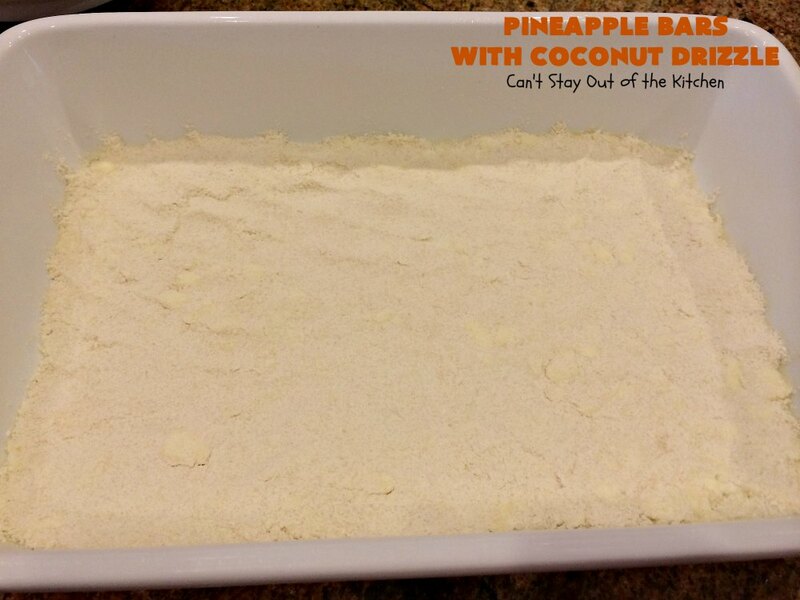 NOTE: The original recipe said to bake the pineapple layer for an hour. My oven had this ready in 35 minutes. Check your oven and cook recipe until set. NOTE: Milk will not work well for this icing. Luscious dessert bars have a crust layer, topped with a pineapple layer and streusel topping, then glazed with a coconut drizzle. 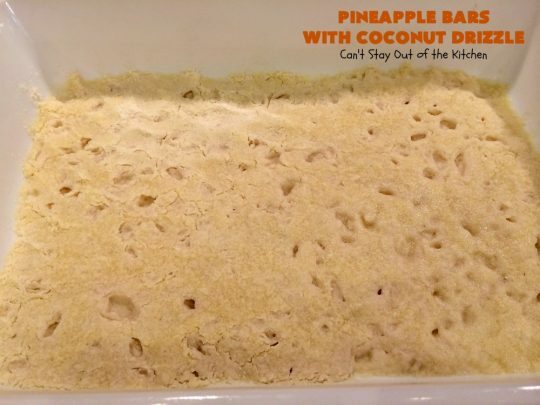 Taste like pina colada bars! Pour remaining crumbs into a greased 9×13” baking dish and press down firmly. 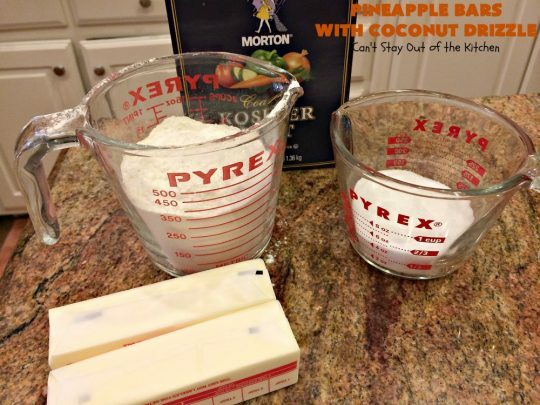 The original recipe said to bake the pineapple layer for an hour. My oven had this ready in 35 minutes. Check your oven and cook recipe until set. 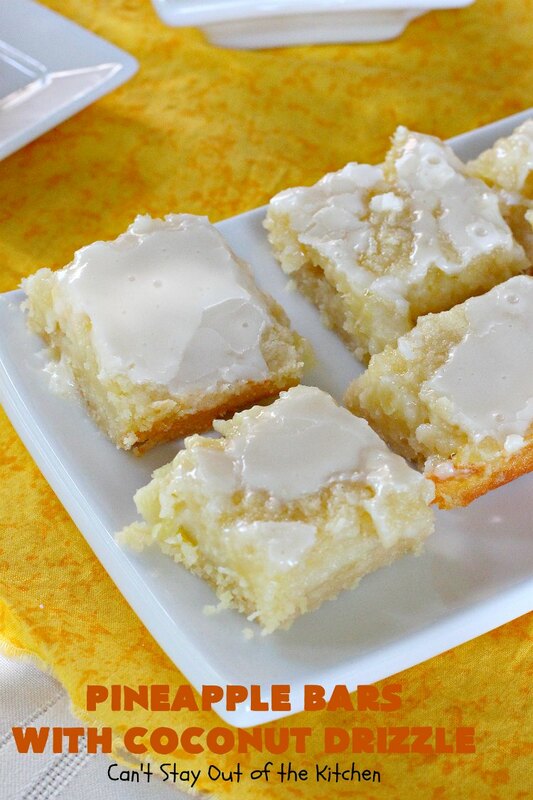 Pineapple Bars with Coconut Drizzle are sure to satisfy any sweet tooth craving! 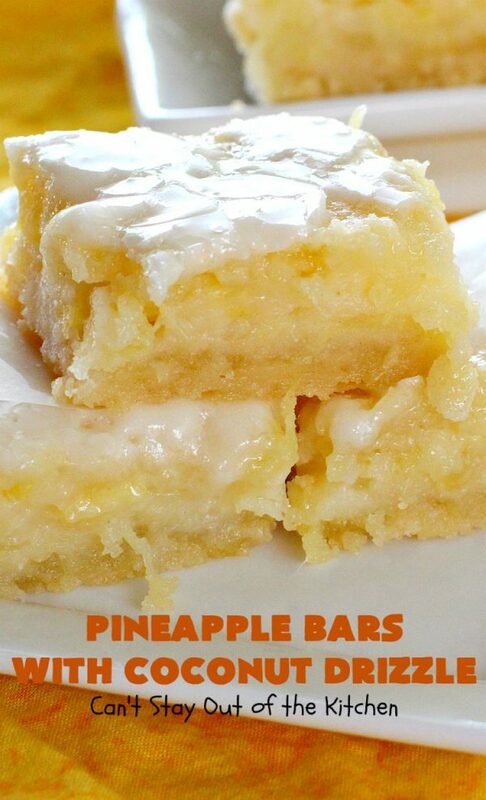 Don’t Pineapple Bars with Coconut Drizzle look spectacular? Prepare yourself for an amazing dessert! You will be raving over this one after one bite! You’re welcome. We loved the way these turned out. I also have one featuring peaches. You may want to check it out, too. Hi Teresa – I’m so glad you loved these so much! 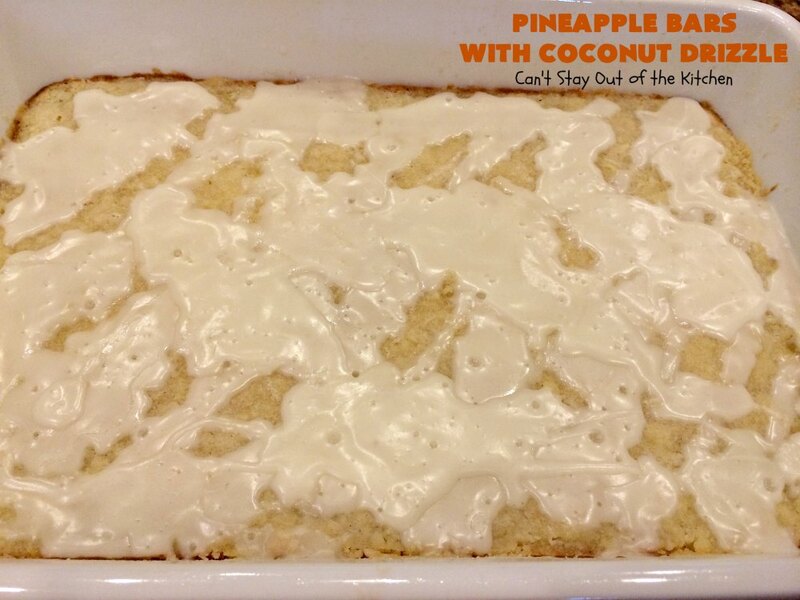 My daughter said I should have called them Piña Colada bars as we’ll!! Thanks for posting and linking me in! We LOVED them, Kathi! Not only that, the folks I gave a container too also couldn’t stop talking about them. They loved them too!